While my daughter was at yoga for an hour I went for a photo walk to a place called "the Spit". I found this feather and wedged it in the crack of this railing on a dock. It was windy and the sun was shining right at me. The bokeh was caused by the light hitting the moving water. Oh this is nice! Have you ever tried doing yoga with her? I love it! sweet shot! love that bokeh! @amandal I've never done it with her but I have done a few classes. She does it with the swim club kids as dry land training. I joked today that I would like to come and she was horrified by the idea. Awesome bokeh and interesting subject! nice picture! LOVE! 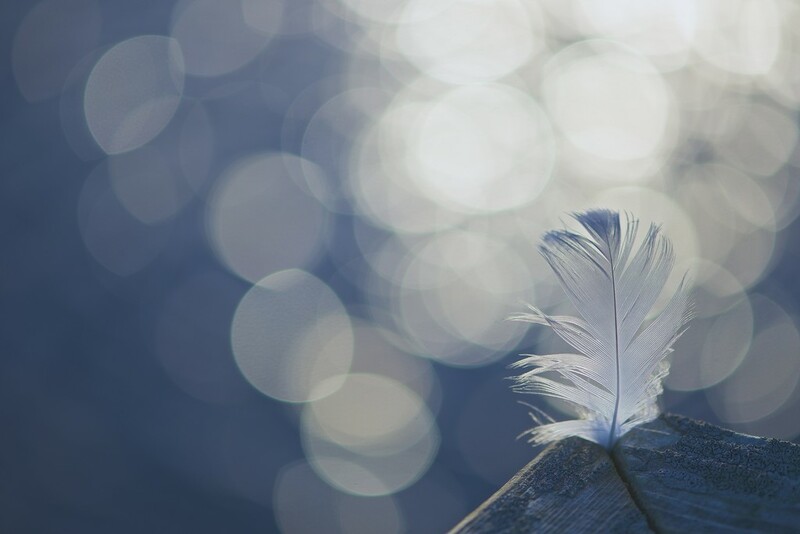 The featheriness of the feather and the superfab bokeh make a great combination! Awesome picture. Looks even better if that is possible on black. Very pretty. Hope you are feeling better. Fav, Kim. Beautifully composed and elegantly simple. Absolute fav for the photo, the description, and the fact that it was all there - not a set up photo! Beautiful. There just aren't enough words to describe the beauty of this photo. Thank you for sharing it! saw this on the PP, very impressive shot, fab so I'll fav. This is wonderful. I love the bokeh, too. Fav! That bokeh is fantastic! Fav for me! What a fantastic find. The bokeh is amazing, and I love the cool tones. Gorgeous! How nicely put together. Those color tones are awesome against the white feather - love how you caught the bokeh in the background. Amazing bokeh... a lovely image. Gorgeous bokeh and feather. So pretty. Now that's just a cool capture! !